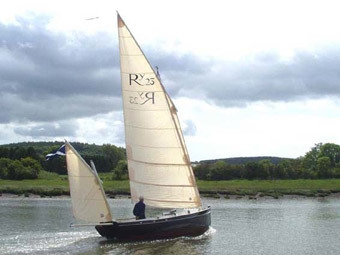 David Collin has very kindly sent me some photographs of his lovely Romilly Speedwell which he mainly day sails out of Kirkcudbright in South West Scotland. 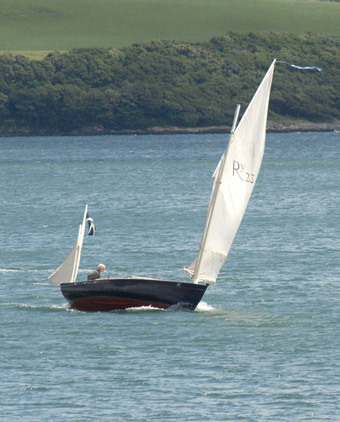 I attach a few pictures of my boat, Speedwell. She was completed from a kit, but to be more accurate, only fitting out was required. I launched her in 2000 since when she has been a constant source of pleasure. She is mostly used for day sailing here at Kirkcudbright, but I did take her over to the Isle of Man a few years ago for the Peel Traditional Boat Festival, which was a great success. I have nothing but praise for her sailing and sea keeping qualities, and have made no modifications to her whatsoever. She is almost a completely standard boat. 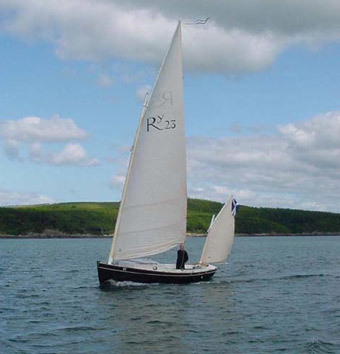 I sail single- handed nearly all the time and have therefore fitted cleats for the mainsheet on the main side benches, abeam of the head of the tiller, and just under the edge of the cockpit coaming.